In a nutshell, the quartermasters are responsible for providing the Army with right supplies, in the right quantities, at the right time and place. The Quartermaster ethos is described this way: "Logistics warriors who are soldiers first, technicians second to none; battle focused; reliable professionals assuring victory by sustaining America's Army in peace and war." Below are the military occupational specialties (MOS) that fall into the Quartermaster's Corps Field. The Automated Logistical Specialist is primarily responsible for supervising and performing management or warehouse functions to maintain equipment records and parts. 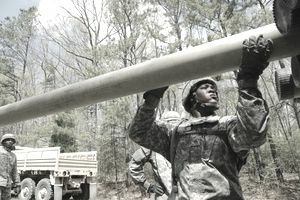 Job training for MOS 92A includes ten weeks of Basic Combat Training (boot camp) and 12 weeks of Advanced Individual Training (AIT) at Fort Lee in Virginia. You'll need to score at least a 90 in the clerical (CL) aptitude segment of the Armed Services Vocational Aptitude Battery (ASVAB) tests. No Department of Defense security clearance is needed for this job. Petroleum supply specialists are primarily responsible for supervising and managing the reception, storage, and shipping of bulk or packaged petroleum-based products. After ten weeks of boot camp, these soldiers spend 10.5 weeks in AIT at Fort Lee. To qualify for this job, you'll need an 86 on the clerical section of the ASVAB and an 85 in the operators and food (OF) section. A valid state driver's license and normal color vision also are required. The culinary specialist feeds the rest of the Army: their job is to prepare and serve food in field or garrison food service operations. After boot camp, you'll spend eight weeks at Fort Lee learning how to prepare food, how to store perishables safely and how to prepare menus for special dietary needs. To qualify for this job, you'll need a score of 85 in the operators and food (OF) area of the ASVAB, and have to have normal color vision. These soldiers supervise and conduct lab tests on petroleum, oil and lubricant products to ensure safety in handling and usage. You'll spend ten weeks at Fort Lee after boot camp, learning testing methods, and how to use equipment like spectrometers and centrifuges. A score of 91 on the skilled technical (ST) portion of the ASVAB is required. This difficult job is, unfortunately, a crucial part of the Army. They help with the process of identifying deceased soldiers and safeguarding their personal effects and help with funeral services. Qualifying for this job requires an 88 on the general maintenance (GM) area of the ASVAB, but there's no DoD security clearance required. For obvious reasons, this job has no margin for error. Attention to detail is crucial. In addition to rigging parachutes, these soldiers repair and test them for safety. Eight weeks at Fort Lee for AIT follows ten weeks of boot camp. You'll need an 88 in the general maintenance (GM) aptitude area and an 87 in combat (CO) on the ASVAB. Shower/laundry and clothing repair specialists are like the Army's dry cleaners and tailors. They make sure soldiers' uniforms are clean and mended according to military standards and regulations. Boot camp is followed by eight weeks in AIT at Fort Lee. Soldiers in this job need an 84 on the general mechanical segment of the ASVAB. Water treatment specialists oversee and maintain water purification equipment, and inspect Army facilities and food supplies for the presence of disease, germs or other health and environmental hazards. To qualify for this MOS, you'll need a score of 88 on the general maintenance portion of the ASVAB tests. Your training will span 13 weeks at Fort Lee, once you've completed boot camp. The unit supply specialist takes care of the upkeep and maintenance of all Army supplies and equipment. After ten weeks of boot camp, these soldiers spend eight weeks in AIT at Fort Lee. A score of 90 on the clerical portion of the ASVAB is required.